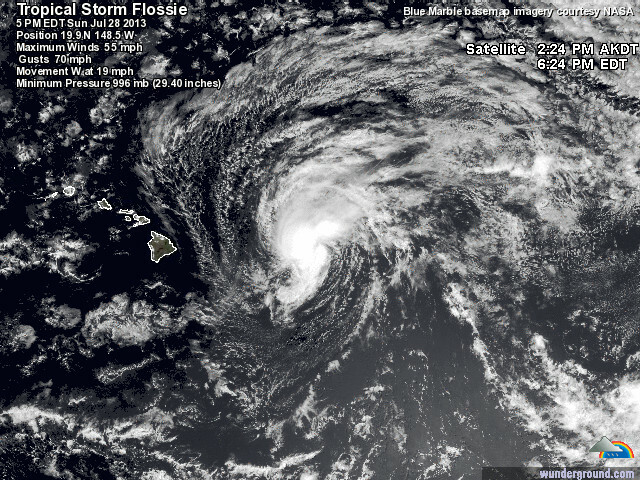 TS FLOSSIE takes aim at Hawaii: Why is it so invulnerable to hurricanes? Tropical Storm Flossie as of 5PM EDT on July 28, 2013. It is 430 miles east of Hilo with maximum winds of 55 mph. Surfs up! Flossie is about to begin lashing Hawaii’s big island with strong winds, heavy rain, and some big waves. Tropical storm warnings are in effect for all but the northernmost islands, which are still under watches. It seems the tropical storm season is beginning to wake up, and its chose an unusual place to do so. For most Americans, the hurricane basin of interest for tropical weather is the North Atlantic, where storms (like Dorian, which lost its Tropical Depression status yesterday) begin to form off the North African coast and track westward towards the Caribbean and Gulf of Mexico. The other hurricane basin, the Eastern Pacific, rarely impacts the US. Storms that form here will make landfall on the western coasts of Mexico or Central America, if at all. Hawaii, in the middle of the North Pacific and at 20 degrees North latitude, seems like the perfect place for hurricane strikes. However, they are rare here. Only the northern island of Kaui has seen a direct impact from a hurricane or tropical storm since 1950! The most recent was Hurricane Iniki in 1992, which disrupted the filming of the movie Jurassic Park. Flossie is expected to defy history and make landfall on the big island or Maui. Hurricanes and tropical storms need water temperatures of 80 degrees Fahrenheit or warmer to retain their strength. These clockwise winds form a semi-permanent, high pressure pattern known as the Pacific High. It exists throughout the summer months, only breaking down when a trough in the jet stream approaches from the northwest. When this high is in place, the wind pattern produces a level of wind shear (change in wind direction/strength with height) that will weaken or destroy any hurricane or tropical storm that approaches. Take a look at the next two images; one will show a strong Pacific high in place, the other will show today’s conditions. You will notice a much weakens high caused by a trough. The trough will be marked by a dotted red line. Flossie does not have the strong Pacific High to contend with, and that is why she has stayed together long enough to make this approach. 6 to 10 inches of rainfall are expected for the southern islands; flash floods and mud slides will be a real danger. For a full run-down on what the storm will bring, visit the Central Pacific Hurricane Center page. Many storms have weakened or dissipated before making landfall. If you’re reading this from the Aloha state, please be safe. (Don’t go surfing.) Even a tropical storm can cause significant damage. P.S. Wildcard Weather is now over a year old! Thanks for reading. ← Climate Change at the bottom of the world, don’t forget about penguins! Thank you so much! There’s no better compliment I can get than that a post is presented in an easy-to-understand way.